Is your patio space feeling a little drab? Does your outdoor cooking area consist of a pitted, rusty charcoal grill over in the corner that was covered in snow a few months ago? Are you looking to spruce up your outdoor kitchen for the coming season? If so, we have put together this short idea board containing several products that are sure to bring the awesome to your patio! 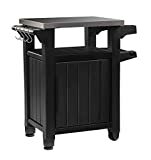 From outdoor kegerators for the homebrewer to outdoor super high-temperature wood-fired ovens for the home cooked pizza chef, these five outdoor kitchen essentials will make you want to cook outside every day, even in the winter! Make outdoor prep work, serving, and storage a breeze with the Keter Unity XL indoor/outdoor prep station. This handsome all-weather rolling prep island is ideal for both indoor and outdoor cooking! It is available in two sizes and features a stainless steel top and durable espresso brown all-weather resin base with a sealed cabinet. It is basically a wheeled deck box, with a stainless steel top and shelf. Super useful! The Keter Unity XL outdoor prep and utility cart is a super useful tool to make outdoor cooking a breeze! If you plan to leave this cart exposed to the elements, it’s a good idea to get a cover [Amazon Link] for it in order to protect the stainless steel top from rust. These cabinets are sealed, and for the most part do not let water in, though theoretically water could penetrate. A cover will help for these circumstances. Some customers have found that their box is damaged upon receipt, and if this happens to you, be sure to contact Keter immediately to remedy the situation. In case of damage down the road, we love the fact that the Keter Unity cabinets are covered under a two-year warranty! Sick of dealing with refilling your ugly, musty cooler with more ice in order to keep your drinks cold? It’s time to transition to an outdoor refrigerator! 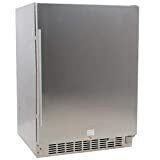 The EdgeStar CBR1501SSOD is essentially a dorm refrigerator on steroids, with a beautiful stainless steel look, a sealed design that can be safely used outdoors, and capacity for 142 cans! The door can be reversed depending on your needs, and it even has a lock to keep the kids away from the… soda. We selected this fridge as the best outdoor refrigerator. For a complete review of it, see the link. The EdgeStar outdoor refrigerator is a great choice for outdoor beverage cooling and storage and can store beer, wine, and any other bottles you need. It will keep your drinks cool, even if the outdoor temperatures get up to 95! It looks great, is secure, and will let you keep the cooler in the basement to pull out for camping and tailgating. It is available with free shipping to the curb, but you’ll have to bring it inside. 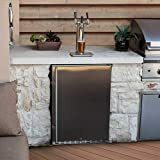 For outdoor rated Kegerators, the EdgeStar 3 Tap Stainless Steel Kegerator is a fantastic choice. It is reasonably priced, has all the fittings you’ll need, looks great, and works quite well. One note: if the power to the kegerator goes out and then comes back on, be sure to manually confirm that the unit powers back up. The EdgeStar Triple Tap Kegerator is covered under EdgeStar’s 1-year warranty, and will keep the party going for a long time. Fresh, home brewed beer, on the patio! Need we say more? Delivery on these units is curbside. If you like outdoor cooking, the Char-Griller Akorn Kamado Grill will change your life. 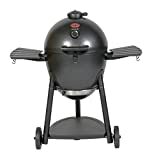 This grill is incredibly powerful and versatile, and is a surprisingly good option for a high quality Kamado grill, at an unbeatable price point! These grills are insulated so they don’t use as much charcoal as a typical grill, but are capable of putting out insane heat onto the large 447 sq inches of cooking area. These versatile grills can be adapted for several different cooking methods, from smoking to full on fireball searing. Total Cooking Area: 447″ sq, with 314″ of primary grill area and 133″ in the warming rack. This grill is not made out of ceramic, unlike some of the competition like the Big Green Egg. Rather, it is made of sturdy steel and is insulated, with a porcelain coating. It works very similarly to a ceramic grill, but it is stronger, less likely to get damaged by impact, and is cheaper than a ceramic grill. The Char-Griller Akorn Kamado grill really is a great choice for many looking for an exciting new grill to spice up the cooking experience. Be sure to regularly clean out the charcoal to make sure the air is flowing smoothly through the grill, and pick up a grill cover for this grill, to ensure that it stays in top shape. If a Kamado grill isn’t exotic enough for your tastes, or you really want a ready-made outdoor wood-fired pizza oven, the Alfresco Home Fornetto Wood Fired Oven is a great solution! These outdoor ovens look super cool, use wood or lump briquettes to cook for incredible flavor, and can cook your pizza at ultra-hot temperatures in no time flat. Click here for more outdoor pizza oven ideas! When it comes to high-temperature wood-fired cooking, the Alfresco Home Fornetto grill is an outstanding choice. These grills are made of high-quality materials, primarily stainless steel and an enamel coating. Everything you need is included — no need to even pick up a cover! If you love to make pizza, there’s no comparison on the results from a conventional inside oven and a Fornetto grill cooking at maximum temperature. These units ship with free shipping, but it is a curbside drop off, and they are heavy, so be prepared.